Slice 900g peeled potatoes very thinly. 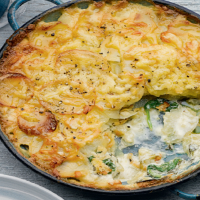 Butter a 22cm gratin dish and arrange a layer of potatoes, a layer of raw baby spinach leaves, a layer of potatoes, a layer of spinach and a final layer of potatoes in the dish. Warm 150ml double cream and 200ml milk; season; grate in some nutmeg and pour over the potatoes. Sprinkle with grated cheddar and bake at 160ºC, gas mark 3 for 1½ hours, until tender and golden brown. This recipe was first published in Fri Mar 25 11:44:16 GMT 2011.